The 2015 Boston Marathon start line in Hopkinton, Mass. two days before the race. There are now just days until the 121st running of the Boston Marathon on Monday, April 17, Patriot’s Day in Massachusetts. An estimated 30,000 participants are expected to take part in the Hopkinton, Mass to Boston race. For many, just getting into the Boston Marathon is an accomplishment in and of itself, given the challenging qualifying standards one must meet to guarantee a place in the race. Whether you’re running for the first or 15th time, the Boston Marathon offers a unique challenge that must be faced wisely. Take the course for granted and you could end up paying dearly. In order to help you plan and prepare to run the best race possible, we present our take on the course and offer some tips and suggestions to make the most of your experience. The historic event covers the classic 42.2K (26.2 miles) marathon distance and is run along a point-to-point course from the small town of Hopkinton to downtown Boston. The course is also notable for its net downhill profile, dropping some 450 feet (137m) from start to finish. The course runs in a general northeast direction which can become important when discussing any potential wind. In general, winds from the west and south can help runners achieve faster times while north or worse, east winds can wreak havoc. While the infamous Newton Hills from 16 to 21 miles get a disproportionate amount of attention, it’s actually the first five miles (~8K) of, at times, significant downhill that often prove pivotal to a runner’s success (or lack thereof). Go out too hard and you run the risk of trashing your quads which will be screaming at you long before you ever ascend the top of Heartbreak. In fact, the very first kilometre of the race is the fastest–most downhill–and the temptation to tear down it will be hard to resist on fresh legs. After five very fast (i.e. downhill) kilometres runners enter Ashland around four miles and into Framingham at six miles. If there’s one piece of advice we hope you’ll follow it’s this: Do not destroy yourself in the first 10K! Stay true to your pacing plan; if you find yourself running faster than you should be, slow down. The section from 10-15K offers gently rolling hills with a slight incline from miles 9 to 11 at which point you’ll pass through Natick. Just past 20K, you may begin to hear what will soon become the deafening roar of the Wellesley College “scream tunnel.” Stopping for a photo (or a kiss) from the Wellesley girls is permitted but not encouraged. This also signals that you are almost halfway and you will soon enter into the town of Wellesley and cross the 21.1K mark. RELATED: Running your first Boston Marathon? A first-timers guide to one of America’s greatest races. Just moments later, after passing 15 miles (~24K), you’ll reach another key point of the race, this being another incredibly fast downhill kilometre from 25 to 26K. This point is key because on the one hand, you’ll likely begin to get a sense to how your body is responding to the race so far (including how all those downhill Ks early in the race are affecting your calves and quads), and more significantly because once you reach the bottom, this is the start of the infamous Newton Hills. The first of the four hills is often overlooked in part because of the fast section that proceeds it. The second hill is far steeper and lasts about 400m–you’ll definitely feel this one. Fortunately, there is also a generous section of flat (actually downhill) course that follows each of the hills and lasts long enough to allow recovery before the next hill begins. The third and least intimidating hill comes just before 31K and lasts about a half kilometre. You’ll get a short reprieve and then you’ll face the course’s most famous section: Heartbreak Hill. The hill itself is not particularly grueling–it is neither steep nor long–but comes at a pivotal point. It begins just after 20 miles (32K) which for most people, is around the length of their longest training run. And with 10K still left in the race, you will definitely have a sense of how your race will unfold from here. Crest Heartbreak feeling strong and you can be confident you’re going to have a good race. But if you’re feeling rough at this point, you may have a long way still to go. Fortunately for all, the final five miles (~8K) are mostly downhill which means you can expect to hold or even pick up the pace if you’re feeling good and strong. At 35K you’ll enter into Brookline which is the final town you’ll visit before entering Boston proper. The crowds–which should be noted, are strong throughout the race and said to top one million in total–will begin to become more and more dense (and loud) which should help motivate you during this final stretch. Around 24 miles (38.6K), you will likely catch your first glimpse of the famous ‘Citgo’ sign which many know is located at approximately the one-mile (1,609m) to go mark. Unfortunately that makes the 24th mile seem like one of the longest as the sign bids you closer and closer yet feels just as far away. There is one small hill at 25 miles/40K and now in the city of Boston, you are well on your way to the finish. But first you’ll have to make the “right on Hereford, left on Boylston,” and from there it’s about 500m of gentle downhill to the finish. Marathon Monday is going to be a long day. You’ll need to get up early to board the buses–which leave from Boston Common–to the start and then you’ll wait several hours before the race begins. Consider bringing a book, a crossword puzzle, anything to help beat the boredom and control the nerves. Speaking of the bus ride to the start in Hopkinton. It’s a long ride–at least an hour–on a school bus which means no washrooms. Keep that in mind. Consider–in fact definitely do–wear a completely discardable layer of clothing before the race to keep you warm and dry. Anything and everything left in the village or at the start will not be coming back so avoid wearing clothing you don’t intend to never see again. The same goes for shoes (consider wearing an old pair and putting on your race shoes just before the start). Dress for the weather. If it’s a warm and sunny day, wear sunscreen, a hat and stick to light colours and moisture wicking materials. If it’s going to be wet, prepare accordingly. Once you arrive in the village, find a place and call it your own. You’ll be there for awhile so try and get comfortable. There is water, Gatorade, coffee and even snacks if you need them. Despite the large numbers of them, queues for the toilets are going to be long. Whatever you do, don’t leave this to the last minute. In addition to the toilets in the Athlete’s Villiage, more are available on route to the starting corrals. Depending on your wave and corral assignment, you’ll be called to make your way to the start corrals about an hour before the race. It’s a full mile (1.6K) to the corrals and given all the people, you’ll be forced to do it at a slow walk. Consider this your warm-up and if you can, consider doing your pre-race drills here, if and where space permits. You’ll also be forced to wait in the corral itself and these too become quite crowded. We suggest sticking to either the far right or left-hand side. If you’re in wave one, corral 1 or 2, definitely try to hang out on the left-hand side so you can see the elites exit the church and make their way to the very front. 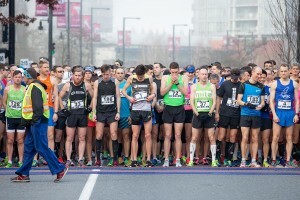 Make no mistake, the first 5K is the most important part of the entire race. You’ll be tempted to run fast given the downhill nature of the course and the fact that you’ll be fresh and full of adrenaline. Do not go out too fast or you will pay later. Stick to your plan. If you’re “lucky,” the large number of other participants will actually slow you down for the first few miles. That is not a bad thing. Be patient. Unlike most races, Boston is large enough that you’ll almost always be surrounded be fellow participants. This can make it difficult to judge your pace since some will be speeding up while others will be slowing down. Hopefully, you have your own unique and specific pacing plan and once again, we highly suggest you follow it. Crowds along the course are plentiful throughout but are particularly large (and loud) in each of the towns you’ll pass through. Use their energy and enthusiasm to take your mind off the race. Look at them, smile often and say “Thanks” when and if you can. Note that there are markers and clocks placed every mile of the race. Unless you started in the first corral, pay no attention to the time on the clock since many seconds (minutes) will have passed between when the gun went off and when you actually crossed the start line. Do however use these markers (there are also kilometre markers for the first 10K as well as at every 5K), to check on your pacing. As in any marathon, be sure to have and follow a personal fueling and hydration plan. 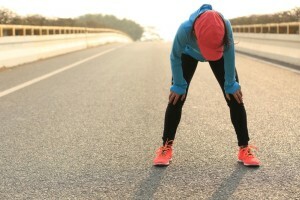 You will hopefully have practiced this in training and found what works best for you but in general, aim to intake 30-60 grams of carbohydrates–in the form of sports drink, energy gels, chews or other–for every hour of running. As in any race, try your best to run the tangents–which is the most direct and therefore shortest route–of the course. Stick to one side of the course and avoid veering back and forth from one side to the other. Break the course into smaller sections or pieces. The easiest way to do this is to consider each 5K (or 10K) as a distinct section. Focus on the section that you’re in and try not to think too much about how far you still have to go or what’s up ahead. Returning to the topic of a pacing plan: be willing to adjust your pacing for the conditions. If it’s particularly warm, humid, windy or wet, you may have to alter your paces to meet the conditions. Likewise, you should expect that some sections of the race–namely, the downhills–are faster than the uphill sections. Be ready to see that your pace from one kilometre (or mile) will vary considerably. This is where ‘running by feel’ can come in handy. Aim to maintain a consistent effort, not necessarily a consistent pace. The section of hills through Newton will be the most physically challenging and with the right training, you will be ready for them. Remember that it is less about the severity–the length or steepness–of the hills and more about the fact that they come at a most difficult part of the race. Fortunately the crowds along this section are strong and you can use their energy to get you through. Once you finally crest Heartbreak, don’t expect to feel amazing and know there is still a long way (about 8K) to go. Take a moment to find your rhythm, do a quick self-assessment and then mentally prepare for the “final” section of the race, which will likely be the toughest. The course is mostly downhill from this point, so use those downhill sections to hold or increase your pace if and when you can. Once you can see the infamous Citgo sign, you’ll know you are getting closer. It seems to linger forever in the distance but when you reach it, you’ll have only one mile to go. Just prior to this, there is one small hill which can seem like a mountain at this point. With less than one kilometre to go, you’ll make a right turn onto Hereford–and have to climb a very gentle rise–and then a left onto Boylston. From here it is only 500m to the finish and it’s all gradually downhill. As bad as you may feel, definitely take a moment to look to your left and to your right and witness all the screaming fans and supporters along the course. Within mere minutes you will be a Boston Marathon finisher. Congratulations!